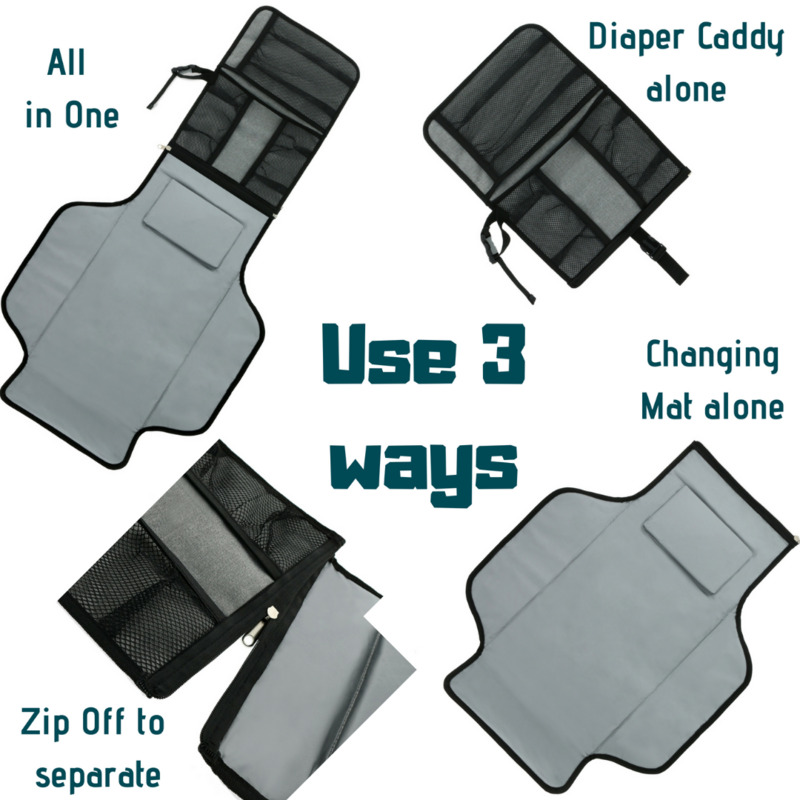 Fits in Your Diaper Bag: Compact size holds your basic diapering needs plus it fits right into your larger bag. Time for a diaper change? No need to drag your whole diaper bag into the changing station. Grab your little diaper clutch, slip on the adjustable wrist strap, and whisk your little one off to the restroom. Travel Companion Perfect when you're traveling and don't want to haul all your luggage into the changing area with you. 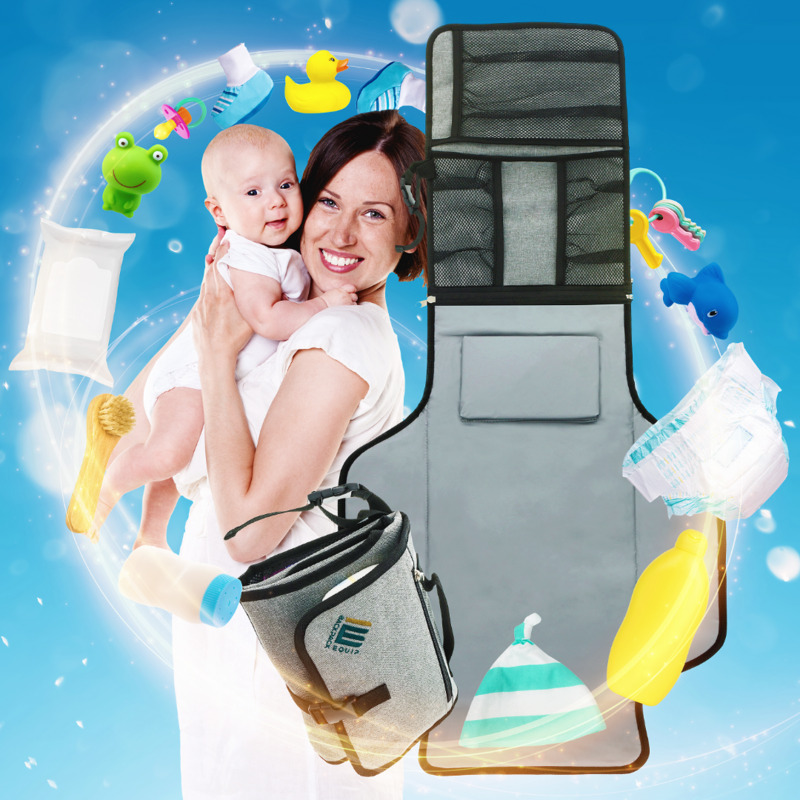 Double benefit is a stroller organizer for your diaper bag accessories. Built to Last: Velcro picks up lint easily making it ineffective and causing your clutch to pop open at the most awkward moments. Our sturdy clip closure keeps your diaper gear safely tucked away where it belongs. The high-quality canvas exterior is not only beautiful, but will also endure the test of time. Our nylon zippers are heavy-duty and meant to last whether you're zipping up your personal gear into the front pocket or zipping off the changing mat. Lifetime Guarantee: At Backpack Equip, we're so sure you'll absolutely love your new purchase that we're offering a 100% Money Back Lifetime Guarantee. 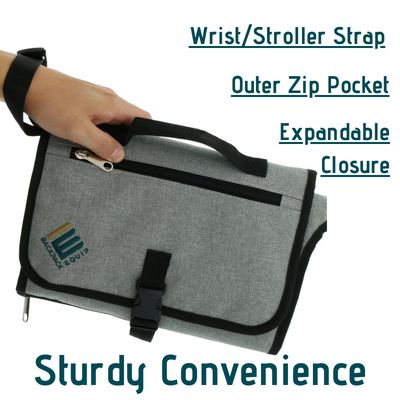 Expandable to hold all your diaper changing gear plus a fresh outfit for baby in one compact clutch. Hang it from your wrist, stroller, or car seat with the convenient adjustable strap..
Organize baby's diapering must-haves without the fuss of all the extra stuff; cleverly designed for all your baby diaper needs. BOOST BABY’S COMFORT WITH MAXIMUM PROTECTION==>Extra large changing mat protects baby bum from germs on public surfaces with an extra thick pillow for ultimate baby comfort. Plus easy to wipe clean with sanitizing wipes. Some outings require a ton of stuff for you and Baby, but sometimes you just don't need all the extra gear. 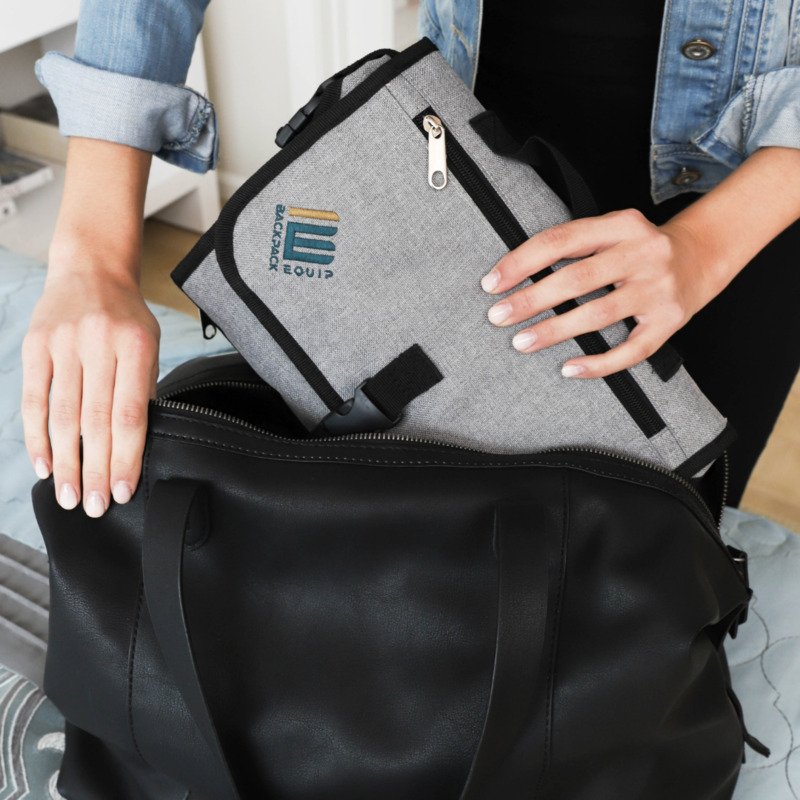 Those are the times you'll want to use our Portable Changing Pad as a Diaper Clutch Purse. Mom's ID, phone, and money have their own pocket leaving plenty of room for a couple of diapers, wipes, creams, and maybe even a fresh outfit for Baby. Stylish yet simple no one will know it's a diaper bag. Compact enough to slip into her larger bag, yet spacious enough to hold everything mom needs plus she will love it. It will be the hit of the shower! Your purchase comes with a lifetime guarantee and if you ever feel our product is not performing as it should, we'll either exchange it for a new one or we will simply refund you. You're Welcome! Thank you for this great product demonstration of our Portable Changing Pad, can't be any simpler. Simplify your life. "I would love to recommend this diaper bag to all parents! I had purchased a giant purse style diaper bag (being a first-time mom) and found that it got left at the house or in the car all the time. After trying this backpack diaper bag the other one has been promptly donated. This backpack diaper bag is first off, super cute and gender neutral. It is even something that my husband feels comfortable wearing when he takes the baby out. It is super comfortable and the adjustable straps make it easy to fit to different body types. 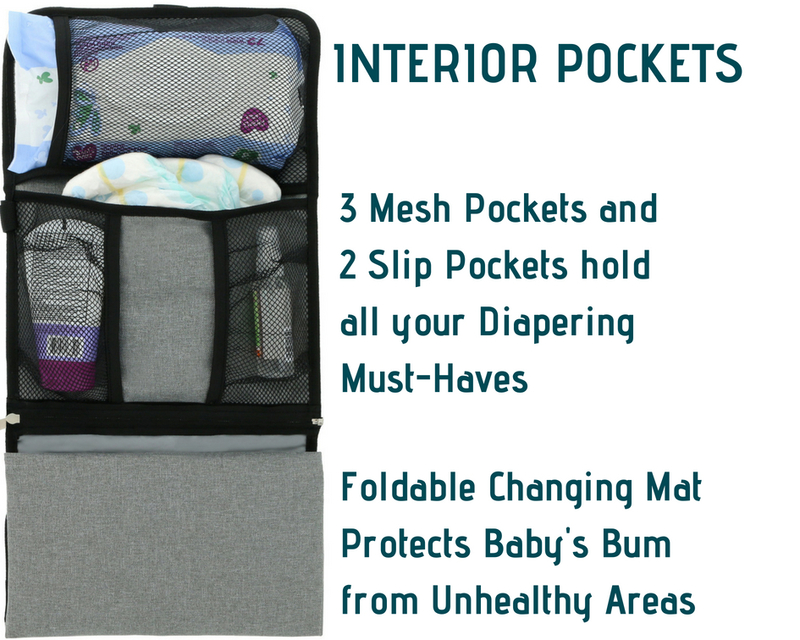 It has so many pockets inside and even comes with a super cool travel diaper changing pad (that doesn't take up too much space!). This bag has so much space for baby and for all of my gear. 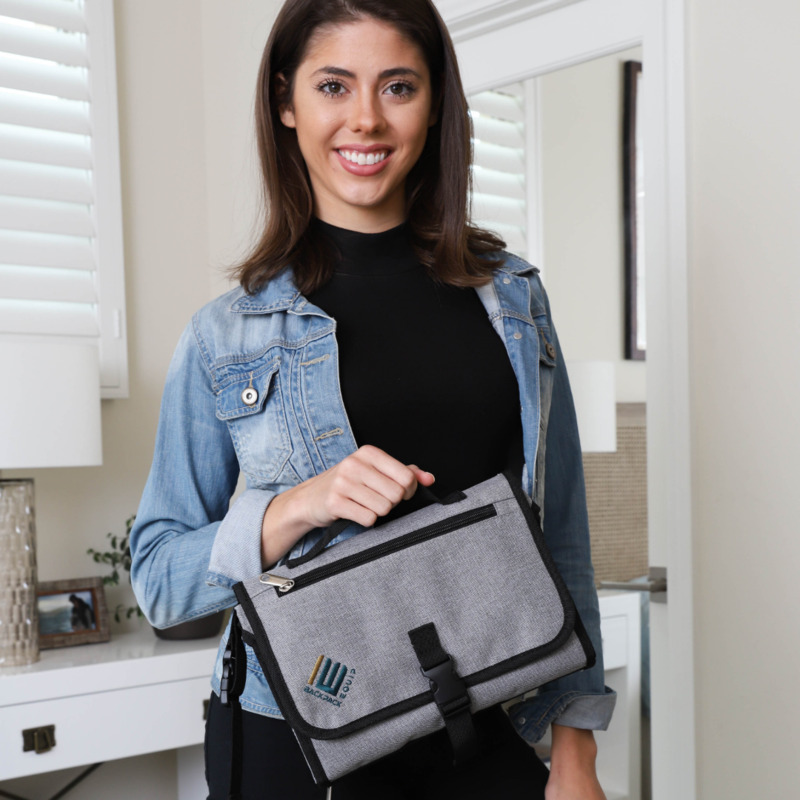 It is so practical and has eliminated the need for me to carry a purse as well as a diaper bag. This bag is incredible and I highly recommend to anyone who is considering any other diaper bag!" "This bag is fantastic. Plenty of pockets for everything and anything for you and your baby. 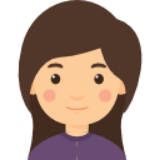 I would definitely recommend it." "This bag just arrived the other day and it has been used every day since! It was intended for the baby that has yet to come, but I used it for the older 2 to take all their belongings (snow pants, hat's, gloves) to daycare. And it was super easy for my 5-year-old to throw it on as a backpack and help me haul stuff up to the door. I also ended up using it as a purse today and loved the side zipper pockets for my keys and smartphone. And easy to carry and leave me hands-free so I didn't fall on the ice!!! This bag is going to have so many purposes I'm afraid we will wear it out and need another!! Thank you again, we love this bag!" "We love our bag! So helpful having a huge bag for when our new one comes! And helpful now for my 2-year-old when she gets to go see her Nana and Papa and right now she packs all of her toys in it....and she doesn't leave the house without all of her favorite babies!"